On page 3459, Al-aidaroos and colleagues demonstrate that protein phosphatase of regenerating liver-3 (PRL-3) promotes EGFR activation and oncogenic addiction. The researchers demonstrate that elevated PRL-3 predicted treatment response to a pharmacological inhibitor of EGFR and uncover a mechanism for PRL-3 in cancer progression. Here, EGF-stimulated human cancer cells are shown, with staining for phospho-tyrosyl–activated proteins (red), EGFP-PRL-3 (green), and DNA (blue). Citation Information: J Clin Invest. 2013;123(8):3186-3187. https://doi.org/10.1172/JCI71316. Citation Information: J Clin Invest. 2013;123(8):3188-3189. https://doi.org/10.1172/JCI71579. Citation Information: J Clin Invest. 2013;123(8):3201-3203. https://doi.org/10.1172/JCI67526. The core of an atheromatous plaque contains lipids, macrophages, and cellular debris, typically covered by a fibrous cap that separates the thrombogenic core from the blood. Rupture of the fibrous cap causes most fatal myocardial infarctions. Interstitial collagen confers tensile strength on the cap, as it does in skin and tendons. In 1994, Peter Libby and colleagues demonstrated overexpression of collagenolytic enzymes in atheromatous plaques and implicated MMPs in the destabilization of these lesions. Citation Information: J Clin Invest. 2013;123(8):3204-3206. https://doi.org/10.1172/JCI70800. The discovery that rapamycin increased the lifespan of mice was recognized by Science as one of the top 10 scientific breakthroughs of 2009. In addition to increasing lifespan, Neff and colleagues show that while rapamycin improves several functions/pathologies that change with age, it has little effect on the majority of the physiological and structural parameters they evaluated. What do these data tell us about the ability of rapamycin to delay aging and improve quality of life, i.e., prevent the fate of Tithonus? Citation Information: J Clin Invest. 2013;123(8):3206-3208. https://doi.org/10.1172/JCI70799. Protection of hair cells by HSP70 released by supporting cells is reported by May et al. 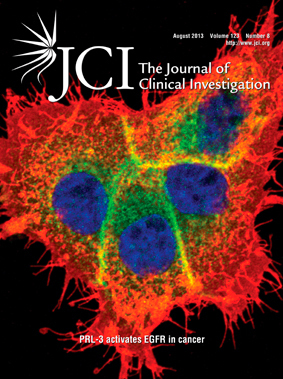 in this issue of the JCI. Their findings suggest a new way to reduce ototoxicity from therapeutic medications and raise larger questions about the role and integration of heat shock proteins in non–cell-autonomous responses to stress. Increasing evidence suggests an important role for extracellular heat shock proteins in both the nervous system and the immune system. The work also suggests that defective chaperones could cause ear disease and supports the potential use of chaperone therapeutics. Citation Information: J Clin Invest. 2013;123(8):3208-3210. https://doi.org/10.1172/JCI70226. Citation Information: J Clin Invest. 2013;123(8):3211-3230. https://doi.org/10.1172/JCI65521. Aberrant expression of apurinic-apyrimidinic endonuclease–1 (APEX1) has been reported in numerous human solid tumors and is positively correlated with cancer progression; however, the role of APEX1 in tumor progression is poorly defined. Here, we show that APEX1 contributes to aggressive colon cancer behavior and functions as an upstream activator in the Jagged1/Notch signaling pathway. APEX1 overexpression or knockdown in human colon cancer cell lines induced profound changes in malignant properties such as cell proliferation, anchorage-independent growth, migration, invasion, and angiogenesis in vitro and in tumor formation and metastasis in mouse xenograft models. These oncogenic effects of APEX1 were mediated by the upregulation of Jagged1, a major Notch ligand. Furthermore, APEX1 expression was associated with Jagged1 in various colon cancer cell lines and in tissues from colon cancer patients. This finding identifies APEX1 as a positive regulator of Jagged1/Notch activity and suggests that it is a potential therapeutic target in colon cancers that exhibit high levels of Jagged1/Notch signaling. Citation Information: J Clin Invest. 2013;123(8):3231-3242. https://doi.org/10.1172/JCI67655. MerTK, a receptor tyrosine kinase (RTK) of the TYRO3/AXL/MerTK family, is expressed in myeloid lineage cells in which it acts to suppress proinflammatory cytokines following ingestion of apoptotic material. Using syngeneic mouse models of breast cancer, melanoma, and colon cancer, we found that tumors grew slowly and were poorly metastatic in MerTK–/– mice. Transplantation of MerTK–/– bone marrow, but not wild-type bone marrow, into lethally irradiated MMTV-PyVmT mice (a model of metastatic breast cancer) decreased tumor growth and altered cytokine production by tumor CD11b+ cells. Although MerTK expression was not required for tumor infiltration by leukocytes, MerTK–/– leukocytes exhibited lower tumor cell–induced expression of wound healing cytokines, e.g., IL-10 and growth arrest-specific 6 (GAS6), and enhanced expression of acute inflammatory cytokines, e.g., IL-12 and IL-6. Intratumoral CD8+ T lymphocyte numbers were higher and lymphocyte proliferation was increased in tumor-bearing MerTK–/– mice compared with tumor-bearing wild-type mice. Antibody-mediated CD8+ T lymphocyte depletion restored tumor growth in MerTK–/– mice. These data demonstrate that MerTK signaling in tumor-associated CD11b+ leukocytes promotes tumor growth by dampening acute inflammatory cytokines while inducing wound healing cytokines. These results suggest that inhibition of MerTK in the tumor microenvironment may have clinical benefit, stimulating antitumor immune responses or enhancing immunotherapeutic strategies. Citation Information: J Clin Invest. 2013;123(8):3243-3253. https://doi.org/10.1172/JCI69134. Citation Information: J Clin Invest. 2013;123(8):3254-3271. https://doi.org/10.1172/JCI66778. For most lysosomal storage diseases (LSDs) affecting the CNS, there is currently no cure. The BBB, which limits the bioavailability of drugs administered systemically, and the short half-life of lysosomal enzymes, hamper the development of effective therapies. Mucopolysaccharidosis type IIIA (MPS IIIA) is an autosomic recessive LSD caused by a deficiency in sulfamidase, a sulfatase involved in the stepwise degradation of glycosaminoglycan (GAG) heparan sulfate. Here, we demonstrate that intracerebrospinal fluid (intra-CSF) administration of serotype 9 adenoassociated viral vectors (AAV9s) encoding sulfamidase corrects both CNS and somatic pathology in MPS IIIA mice. Following vector administration, enzymatic activity increased throughout the brain and in serum, leading to whole body correction of GAG accumulation and lysosomal pathology, normalization of behavioral deficits, and prolonged survival. To test this strategy in a larger animal, we treated beagle dogs using intracisternal or intracerebroventricular delivery. Administration of sulfamidase-encoding AAV9 resulted in transgenic expression throughout the CNS and liver and increased sulfamidase activity in CSF. High-titer serum antibodies against AAV9 only partially blocked CSF-mediated gene transfer to the brains of dogs. Consistently, anti-AAV antibody titers were lower in CSF than in serum collected from healthy and MPS IIIA–affected children. These results support the clinical translation of this approach for the treatment of MPS IIIA and other LSDs with CNS involvement. Citation Information: J Clin Invest. 2013;123(8):3272-3291. https://doi.org/10.1172/JCI67674. Aging is a major risk factor for a large number of disorders and functional impairments. Therapeutic targeting of the aging process may therefore represent an innovative strategy in the quest for novel and broadly effective treatments against age-related diseases. The recent report of lifespan extension in mice treated with the FDA-approved mTOR inhibitor rapamycin represented the first demonstration of pharmacological extension of maximal lifespan in mammals. Longevity effects of rapamycin may, however, be due to rapamycin’s effects on specific life-limiting pathologies, such as cancers, and it remains unclear if this compound actually slows the rate of aging in mammals. Here, we present results from a comprehensive, large-scale assessment of a wide range of structural and functional aging phenotypes, which we performed to determine whether rapamycin slows the rate of aging in male C57BL/6J mice. While rapamycin did extend lifespan, it ameliorated few studied aging phenotypes. A subset of aging traits appeared to be rescued by rapamycin. Rapamycin, however, had similar effects on many of these traits in young animals, indicating that these effects were not due to a modulation of aging, but rather related to aging-independent drug effects. Therefore, our data largely dissociate rapamycin’s longevity effects from effects on aging itself. Citation Information: J Clin Invest. 2013;123(8):3292-3304. https://doi.org/10.1172/JCI40609. About 10% of Down syndrome (DS) infants are born with a transient myeloproliferative disorder (DS-TMD) that spontaneously resolves within the first few months of life. About 20%–30% of these infants subsequently develop acute megakaryoblastic leukemia (DS-AMKL). Somatic mutations leading to the exclusive production of a short GATA1 isoform (GATA1s) occur in all cases of DS-TMD and DS-AMKL. Mice engineered to exclusively produce GATA1s have marked megakaryocytic progenitor (MkP) hyperproliferation during early fetal liver (FL) hematopoiesis, but not during postnatal BM hematopoiesis, mirroring the spontaneous resolution of DS-TMD. The mechanisms that underlie these developmental stage–specific effects are incompletely understood. Here, we report a striking upregulation of type I IFN–responsive gene expression in prospectively isolated mouse BM- versus FL-derived MkPs. Exogenous IFN-α markedly reduced the hyperproliferation FL-derived MkPs of GATA1s mice in vitro. Conversely, deletion of the α/β IFN receptor 1 (Ifnar1) gene or injection of neutralizing IFN-α/β antibodies increased the proliferation of BM-derived MkPs of GATA1s mice beyond the initial postnatal period. We also found that these differences existed in human FL versus BM megakaryocytes and that primary DS-TMD cells expressed type I IFN–responsive genes. We propose that increased type I IFN signaling contributes to the developmental stage–specific effects of GATA1s and possibly the spontaneous resolution of DS-TMD. Citation Information: J Clin Invest. 2013;123(8):3305-3316. https://doi.org/10.1172/JCI65390. Type 2 diabetes (T2DM) commonly arises from islet β cell failure and insulin resistance. Here, we examined the sensitivity of key islet-enriched transcription factors to oxidative stress, a condition associated with β cell dysfunction in both type 1 diabetes (T1DM) and T2DM. Hydrogen peroxide treatment of β cell lines induced cytoplasmic translocation of MAFA and NKX6.1. In parallel, the ability of nuclear PDX1 to bind endogenous target gene promoters was also dramatically reduced, whereas the activity of other key β cell transcriptional regulators was unaffected. MAFA levels were reduced, followed by a reduction in NKX6.1 upon development of hyperglycemia in db/db mice, a T2DM model. Transgenic expression of the glutathione peroxidase-1 antioxidant enzyme (GPX1) in db/db islet β cells restored nuclear MAFA, nuclear NKX6.1, and β cell function in vivo. Notably, the selective decrease in MAFA, NKX6.1, and PDX1 expression was found in human T2DM islets. MAFB, a MAFA-related transcription factor expressed in human β cells, was also severely compromised. We propose that MAFA, MAFB, NKX6.1, and PDX1 activity provides a gauge of islet β cell function, with loss of MAFA (and/or MAFB) representing an early indicator of β cell inactivity and the subsequent deficit of more impactful NKX6.1 (and/or PDX1) resulting in overt dysfunction associated with T2DM. Citation Information: J Clin Invest. 2013;123(8):3317-3330. https://doi.org/10.1172/JCI67930. Autologous hematopoietic stem cell gene therapy is an approach to treating sickle cell disease (SCD) patients that may result in lower morbidity than allogeneic transplantation. We examined the potential of a lentiviral vector (LV) (CCL-βAS3-FB) encoding a human hemoglobin (HBB) gene engineered to impede sickle hemoglobin polymerization (HBBAS3) to transduce human BM CD34+ cells from SCD donors and prevent sickling of red blood cells produced by in vitro differentiation. The CCL-βAS3-FB LV transduced BM CD34+ cells from either healthy or SCD donors at similar levels, based on quantitative PCR and colony-forming unit progenitor analysis. Consistent expression of HBBAS3 mRNA and HbAS3 protein compromised a fourth of the total β-globin–like transcripts and hemoglobin (Hb) tetramers. Upon deoxygenation, a lower percentage of HBBAS3-transduced red blood cells exhibited sickling compared with mock-transduced cells from sickle donors. Transduced BM CD34+ cells were transplanted into immunodeficient mice, and the human cells recovered after 2–3 months were cultured for erythroid differentiation, which showed levels of HBBAS3 mRNA similar to those seen in the CD34+ cells that were directly differentiated in vitro. These results demonstrate that the CCL-βAS3-FB LV is capable of efficient transfer and consistent expression of an effective anti-sickling β-globin gene in human SCD BM CD34+ progenitor cells, improving physiologic parameters of the resulting red blood cells. Citation Information: J Clin Invest. 2013;123(8):3331-3342. https://doi.org/10.1172/JCI69210. Platelets are anuclear organelle-rich cell fragments derived from bone marrow megakaryocytes (MKs) that safeguard vascular integrity. The major platelet organelles, α-granules, release proteins that participate in thrombus formation and hemostasis. Proteins stored in α-granules are also thought to play a role in inflammation and wound healing, but their functional significance in vivo is unknown. Mutations in NBEAL2 have been linked to gray platelet syndrome (GPS), a rare bleeding disorder characterized by macrothrombocytopenia, with platelets lacking α-granules. Here we show that Nbeal2-knockout mice display the characteristics of human GPS, with defective α-granule biogenesis in MKs and their absence from platelets. Nbeal2 deficiency did not affect MK differentiation and proplatelet formation in vitro or platelet life span in vivo. Nbeal2-deficient platelets displayed impaired adhesion, aggregation, and coagulant activity ex vivo that translated into defective arterial thrombus formation and protection from thrombo-inflammatory brain infarction following focal cerebral ischemia. In a model of excisional skin wound repair, Nbeal2-deficient mice exhibited impaired development of functional granulation tissue due to severely reduced differentiation of myofibroblasts in the absence of α-granule secretion. This study demonstrates that platelet α-granule constituents are critically required not only for hemostasis but also thrombosis, acute thrombo-inflammatory disease states, and tissue reconstitution after injury. Citation Information: J Clin Invest. 2013;123(8):3343-3352. https://doi.org/10.1172/JCI68587. Citation Information: J Clin Invest. 2013;123(8):3353-3362. https://doi.org/10.1172/JCI66634. Vaccine development for the blood stages of malaria has focused on the induction of antibodies to parasite surface antigens, most of which are highly polymorphic. An alternate strategy has evolved from observations that low-density infections can induce antibody-independent immunity to different strains. To test this strategy, we treated parasitized red blood cells from the rodent parasite Plasmodium chabaudi with seco-cyclopropyl pyrrolo indole analogs. These drugs irreversibly alkylate parasite DNA, blocking their ability to replicate. After administration in mice, DNA from the vaccine could be detected in the blood for over 110 days and a single vaccination induced profound immunity to different malaria parasite species. Immunity was mediated by CD4+ T cells and was dependent on the red blood cell membrane remaining intact. The human parasite, Plasmodium falciparum, could also be attenuated by treatment with seco-cyclopropyl pyrrolo indole analogs. These data demonstrate that vaccination with chemically attenuated parasites induces protective immunity and provide a compelling rationale for testing a blood-stage parasite-based vaccine targeting human Plasmodium species. Citation Information: J Clin Invest. 2013;123(8):3363-3372. https://doi.org/10.1172/JCI67911. Macrophages play a key role in responding to pathogens and initiate an inflammatory response to combat microbe multiplication. Deactivation of macrophages facilitates resolution of the inflammatory response. Deactivated macrophages are characterized by an immunosuppressive phenotype, but the lack of unique markers that can reliably identify these cells explains the poorly defined biological role of this macrophage subset. We identified lipocalin 2 (LCN2) as both a marker of deactivated macrophages and a macrophage deactivator. We show that LCN2 attenuated the early inflammatory response and impaired bacterial clearance, leading to impaired survival of mice suffering from pneumococcal pneumonia. LCN2 induced IL-10 formation by macrophages, skewing macrophage polarization in a STAT3-dependent manner. Pulmonary LCN2 levels were tremendously elevated during bacterial pneumonia in humans, and high LCN2 levels were indicative of a detrimental outcome from pneumonia with Gram-positive bacteria. Our data emphasize the importance of macrophage deactivation for the outcome of pneumococcal infections and highlight the role of LCN2 and IL-10 as determinants of macrophage performance in the respiratory tract. Citation Information: J Clin Invest. 2013;123(8):3373-3377. https://doi.org/10.1172/JCI65767. Diabetes elevates the risk for neurological diseases, but little is known about the underlying mechanisms. Brain-derived neurotrophic factor (BDNF) is secreted by microvascular endothelial cells (ECs) in the brain, functioning as a neuroprotectant through the activation of the neurotrophic tyrosine kinase receptor TRKB. In a rat model of streptozotocin-induced hyperglycemia, we found that endothelial activation of MMP9 altered TRKB-dependent trophic pathways by degrading TRKB in neurons. Treatment of brain microvascular ECs with advanced glycation endproducts (AGE), a metabolite commonly elevated in diabetic patients, increased MMP9 activation, similar to in vivo findings. Recombinant human MMP9 degraded the TRKB ectodomain in primary neuronal cultures, suggesting that TRKB could be a substrate for MMP9 proteolysis. Consequently, AGE-conditioned endothelial media with elevated MMP9 activity degraded the TRKB ectodomain and simultaneously disrupted the ability of endothelium to protect neurons against hypoxic injury. Our findings demonstrate that neuronal TRKB trophic function is ablated by MMP9-mediated degradation in the diabetic brain, disrupting cerebrovascular trophic coupling and leaving the brain vulnerable to injury. Citation Information: J Clin Invest. 2013;123(8):3378-3382. https://doi.org/10.1172/JCI67383. Numerous common genetic variants have been linked to blood pressure, but no underlying mechanism has been elucidated. Population studies have revealed that the variant rs5068 (A/G) in the 3′ untranslated region of NPPA, the gene encoding atrial natriuretic peptide (ANP), is associated with blood pressure. We selected individuals on the basis of rs5068 genotype (AG vs. AA) and fed them a low- or high-salt diet for 1 week, after which they were challenged with an intravenous saline infusion. On both diets, before and after saline administration, ANP levels were up to 50% higher in AG individuals than in AA individuals, a difference comparable to the changes induced by high-salt diet or saline infusion. In contrast, B-type natriuretic peptide levels did not differ by rs5068 genotype. We identified a microRNA, miR-425, that is expressed in human atria and ventricles and is predicted to bind the sequence spanning rs5068 for the A, but not the G, allele. miR-425 silenced NPPA mRNA in an allele-specific manner, with the G allele conferring resistance to miR-425. This study identifies miR-425 as a regulator of ANP production, raising the possibility that miR-425 antagonists could be used to treat disorders of salt overload, including hypertension and heart failure. Citation Information: J Clin Invest. 2013;123(8):3383-3394. https://doi.org/10.1172/JCI68395. Citation Information: J Clin Invest. 2013;123(8):3395-3403. https://doi.org/10.1172/JCI68993. Citation Information: J Clin Invest. 2013;123(8):3404-3408. https://doi.org/10.1172/JCI67803. Citation Information: J Clin Invest. 2013;123(8):3409-3419. https://doi.org/10.1172/JCI68049. Wnt/β-catenin/TCF signaling stimulates bone formation and suppresses adipogenesis. The hallmarks of skeletal involution with age, on the other hand, are decreased bone formation and increased bone marrow adiposity. These changes are associated with increased oxidative stress and decreased growth factor production, which activate members of the FOXO family of transcription factors. FOXOs in turn attenuate Wnt/β-catenin signaling by diverting β-catenin from TCF- to FOXO-mediated transcription. We show herein that mice lacking Foxo1, -3, and -4 in bipotential progenitors of osteoblast and adipocytes (expressing Osterix1) exhibited increased osteoblast number and high bone mass that was maintained in old age as well as decreased adiposity in the aged bone marrow. The increased bone mass in the Foxo-deficient mice was accounted for by increased proliferation of osteoprogenitor cells and bone formation resulting from upregulation of Wnt/β-catenin signaling and cyclin D1 expression, but not changes in redox balance. Consistent with this mechanism, β-catenin deletion in Foxo null cells abrogated both the increased cyclin D1 expression and proliferation. The elucidation of a restraining effect of FOXOs on Wnt signaling in bipotential progenitors suggests that FOXO activation by accumulation of age-associated cellular stressors may be a seminal pathogenetic mechanism in the development of involutional osteoporosis. Citation Information: J Clin Invest. 2013;123(8):3420-3435. https://doi.org/10.1172/JCI64060. Hematopoietic stem progenitor cells (HSPCs) are present in very small numbers in the circulating blood in steady-state conditions. In response to stress or injury, HSPCs are primed to migrate out of their niche to peripheral blood. Mobilized HSPCs are now commonly used as stem cell sources due to faster engraftment and reduced risk of posttransplant infection. In this study, we demonstrated that a nucleotide sugar, UDP-glucose, which is released into extracellular fluids in response to stress, mediates HSPC mobilization. UDP-glucose–mobilized cells possessed the capacity to achieve long-term repopulation in lethally irradiated animals and the ability to differentiate into multi-lineage blood cells. Compared with G-CSF–mobilized cells, UDP-glucose–mobilized cells preferentially supported long-term repopulation and exhibited lymphoid-biased differentiation, suggesting that UDP-glucose triggers the mobilization of functionally distinct subsets of HSPCs. Furthermore, co-administration of UDP-glucose and G-CSF led to greater HSPC mobilization than G-CSF alone. Administration of the antioxidant agent NAC significantly reduced UDP-glucose–induced mobilization, coinciding with a reduction in RANKL and osteoclastogenesis. These findings provide direct evidence demonstrating a potential role for UDP-glucose in HSPC mobilization and may provide an attractive strategy to improve the yield of stem cells in poor-mobilizing allogeneic or autologous donors. Citation Information: J Clin Invest. 2013;123(8):3436-3445. https://doi.org/10.1172/JCI66549. Septic shock is characterized by increased vascular permeability and hypotension despite increased cardiac output. Numerous vasoactive cytokines are upregulated during sepsis, including angiopoietin 2 (ANG2), which increases vascular permeability. Here we report that mice engineered to inducibly overexpress ANG2 in the endothelium developed sepsis-like hemodynamic alterations, including systemic hypotension, increased cardiac output, and dilatory cardiomyopathy. Conversely, mice with cardiomyocyte-restricted ANG2 overexpression failed to develop hemodynamic alterations. Interestingly, the hemodynamic alterations associated with endothelial-specific overexpression of ANG2 and the loss of capillary-associated pericytes were reversed by intravenous injections of adeno-associated viruses (AAVs) transducing cDNA for angiopoietin 1, a TIE2 ligand that antagonizes ANG2, or AAVs encoding PDGFB, a chemoattractant for pericytes. To confirm the role of ANG2 in sepsis, we i.p. injected LPS into C57BL/6J mice, which rapidly developed hypotension, acute pericyte loss, and increased vascular permeability. Importantly, ANG2 antibody treatment attenuated LPS-induced hemodynamic alterations and reduced the mortality rate at 36 hours from 95% to 61%. These data indicate that ANG2-mediated microvascular disintegration contributes to septic shock and that inhibition of the ANG2/TIE2 interaction during sepsis is a potential therapeutic target. Citation Information: J Clin Invest. 2013;123(8):3446-3458. https://doi.org/10.1172/JCI67484. Citation Information: J Clin Invest. 2013;123(8):3459-3471. https://doi.org/10.1172/JCI66824. Metastasis-associated phosphatase of regenerating liver-3 (PRL-3) has pleiotropic effects in driving cancer progression, yet the signaling mechanisms of PRL-3 are still not fully understood. Here, we provide evidence for PRL-3–induced hyperactivation of EGFR and its downstream signaling cascades in multiple human cancer cell lines. Mechanistically, PRL-3–induced activation of EGFR was attributed primarily to transcriptional downregulation of protein tyrosine phosphatase 1B (PTP1B), an inhibitory phosphatase for EGFR. Functionally, PRL-3–induced hyperactivation of EGFR correlated with increased cell growth, promigratory characteristics, and tumorigenicity. Moreover, PRL-3 induced cellular addiction to EGFR signaling, as evidenced by the pronounced reversion of these oncogenic attributes upon EGFR-specific inhibition. Of clinical significance, we verified elevated PRL-3 expression as a predictive marker for favorable therapeutic response in a heterogeneous colorectal cancer (CRC) patient cohort treated with the clinically approved anti-EGFR antibody cetuximab. The identification of PRL-3–driven EGFR hyperactivation and consequential addiction to EGFR signaling opens new avenues for inhibiting PRL-3–driven cancer progression. We propose that elevated PRL-3 expression is an important clinical predictive biomarker for favorable anti-EGFR cancer therapy. Citation Information: J Clin Invest. 2013;123(8):3472-3487. https://doi.org/10.1172/JCI60561. Citation Information: J Clin Invest. 2013;123(8):3488-3497. https://doi.org/10.1172/JCI66533. Liver X receptors (LXR) are stimulated by cholesterol-derived oxysterols and serve as transcription factors to regulate gene expression in response to alterations in cholesterol. In the present study, we investigated the role of LXRs in vascular endothelial cells (ECs) and discovered that LXRβ has nonnuclear function and stimulates EC migration by activating endothelial NOS (eNOS). This process is mediated by estrogen receptor-α (ERα). LXR activation promoted the direct binding of LXRβ to the ligand-binding domain of ERα and initiated an extranuclear signaling cascade that requires ERα Ser118 phosphorylation by PI3K/AKT. Further studies revealed that LXRβ and ERα are colocalized and functionally coupled in EC plasma membrane caveolae/lipid rafts. In isolated aortic rings, LXR activation of NOS caused relaxation, while in mice, LXR activation stimulated carotid artery reendothelialization via LXRβ- and ERα-dependent processes. These studies demonstrate that LXRβ has nonnuclear function in EC caveolae/lipid rafts that entails crosstalk with ERα, which promotes NO production and maintains endothelial monolayer integrity in vivo. Citation Information: J Clin Invest. 2013;123(8):3498-3509. https://doi.org/10.1172/JCI68127. Citation Information: J Clin Invest. 2013;123(8):3510-3524. https://doi.org/10.1172/JCI65414. TRAF6, an E3 ubiquitin protein ligase, plays a critical role in T cell tolerance by regulating medullary thymic epithelial cell (mTEC) development. mTECs regulate T cell tolerance by ectopically expressing self-antigens and eliminating autoreactive T cells in the thymus. Here we show that mice with mTEC depletion due to conditional deletion of Traf6 expression in murine thymic epithelial cells (Traf6ΔTEC mice) showed a surprisingly narrow spectrum of autoimmunity affecting the liver. The liver inflammation in Traf6ΔTEC mice exhibited all the histological and immunological characteristics of human autoimmune hepatitis (AIH). The role of T cells in AIH establishment was supported by intrahepatic T cell population changes and AIH development after transfer of liver T cells into immunodeficient mice. Despite a 50% reduction in natural Treg thymic output, peripheral tolerance in Traf6ΔTEC mice was normal, whereas compensatory T regulatory mechanisms were evident in the liver of these animals. These data indicate that mTECs exert a cell-autonomous role in central T cell tolerance and organ-specific autoimmunity, but play a redundant role in peripheral tolerance. These findings also demonstrate that Traf6ΔTEC mice are a relevant model with which to study the pathophysiology of AIH, as well as autoantigen-specific T cell responses and regulatory mechanisms underlying this disease. Citation Information: J Clin Invest. 2013;123(8):3525-3538. https://doi.org/10.1172/JCI68899. Citation Information: J Clin Invest. 2013;123(8):3539-3551. https://doi.org/10.1172/JCI44403. Polymorphisms in the fat mass and obesity-associated gene (FTO) are associated with human obesity and obesity-prone behaviors, including increased food intake and a preference for energy-dense foods. FTO demethylates N6-methyladenosine, a potential regulatory RNA modification, but the mechanisms by which FTO predisposes humans to obesity remain unclear. In adiposity-matched, normal-weight humans, we showed that subjects homozygous for the FTO “obesity-risk” rs9939609 A allele have dysregulated circulating levels of the orexigenic hormone acyl-ghrelin and attenuated postprandial appetite reduction. Using functional MRI (fMRI) in normal-weight AA and TT humans, we found that the FTO genotype modulates the neural responses to food images in homeostatic and brain reward regions. Furthermore, AA and TT subjects exhibited divergent neural responsiveness to circulating acyl-ghrelin within brain regions that regulate appetite, reward processing, and incentive motivation. In cell models, FTO overexpression reduced ghrelin mRNA N6-methyladenosine methylation, concomitantly increasing ghrelin mRNA and peptide levels. Furthermore, peripheral blood cells from AA human subjects exhibited increased FTO mRNA, reduced ghrelin mRNA N6-methyladenosine methylation, and increased ghrelin mRNA abundance compared with TT subjects. Our findings show that FTO regulates ghrelin, a key mediator of ingestive behavior, and offer insight into how FTO obesity-risk alleles predispose to increased energy intake and obesity in humans. Citation Information: J Clin Invest. 2013;123(8):3552-3563. https://doi.org/10.1172/JCI65636. Epigenetic modifications, including changes in DNA methylation, lead to altered gene expression and thus may underlie epileptogenesis via induction of permanent changes in neuronal excitability. Therapies that could inhibit or reverse these changes may be highly effective in halting disease progression. Here we identify an epigenetic function of the brain’s endogenous anticonvulsant adenosine, showing that this compound induces hypomethylation of DNA via biochemical interference with the transmethylation pathway. We show that inhibition of DNA methylation inhibited epileptogenesis in multiple seizure models. Using a rat model of temporal lobe epilepsy, we identified an increase in hippocampal DNA methylation, which correlates with increased DNA methyltransferase activity, disruption of adenosine homeostasis, and spontaneous recurrent seizures. Finally, we used bioengineered silk implants to deliver a defined dose of adenosine over 10 days to the brains of epileptic rats. This transient therapeutic intervention reversed the DNA hypermethylation seen in the epileptic brain, inhibited sprouting of mossy fibers in the hippocampus, and prevented the progression of epilepsy for at least 3 months. These data demonstrate that pathological changes in DNA methylation homeostasis may underlie epileptogenesis and reversal of these epigenetic changes with adenosine augmentation therapy may halt disease progression. Citation Information: J Clin Invest. 2013;123(8):3577-3587. https://doi.org/10.1172/JCI68480. Mechanosensory hair cells are the receptor cells of hearing and balance. Hair cells are sensitive to death from exposure to therapeutic drugs with ototoxic side effects, including aminoglycoside antibiotics and cisplatin. We recently showed that the induction of heat shock protein 70 (HSP70) inhibits ototoxic drug–induced hair cell death. Here, we examined the mechanisms underlying the protective effect of HSP70. In response to heat shock, HSP70 was induced in glia-like supporting cells but not in hair cells. Adenovirus-mediated infection of supporting cells with Hsp70 inhibited hair cell death. Coculture with heat-shocked utricles protected nonheat-shocked utricles against hair cell death. When heat-shocked utricles from Hsp70–/– mice were used in cocultures, protection was abolished in both the heat-shocked utricles and the nonheat-shocked utricles. HSP70 was detected by ELISA in the media surrounding heat-shocked utricles, and depletion of HSP70 from the media abolished the protective effect of heat shock, suggesting that HSP70 is secreted by supporting cells. Together our data indicate that supporting cells mediate the protective effect of HSP70 against hair cell death, and they suggest a major role for supporting cells in determining the fate of hair cells exposed to stress. Citation Information: J Clin Invest. 2013;123(8):3588-3599. https://doi.org/10.1172/JCI69080. Protein quality control and metabolic homeostasis are integral to maintaining cardiac function during stress; however, little is known about if or how these systems interact. Here we demonstrate that C terminus of HSC70-interacting protein (CHIP), a regulator of protein quality control, influences the metabolic response to pressure overload by direct regulation of the catalytic α subunit of AMPK. Induction of cardiac pressure overload in Chip–/– mice resulted in robust hypertrophy and decreased cardiac function and energy generation stemming from a failure to activate AMPK. Mechanistically, CHIP promoted LKB1-mediated phosphorylation of AMPK, increased the specific activity of AMPK, and was necessary and sufficient for stress-dependent activation of AMPK. CHIP-dependent effects on AMPK activity were accompanied by conformational changes specific to the α subunit, both in vitro and in vivo, identifying AMPK as the first physiological substrate for CHIP chaperone activity and establishing a link between cardiac proteolytic and metabolic pathways. Citation Information: J Clin Invest. 2013;123(8):3600-3613. https://doi.org/10.1172/JCI65592. Citation Information: J Clin Invest. 2013;123(8):3614-3623. https://doi.org/10.1172/JCI68487. The unique sensitivity of early red cell progenitors to iron deprivation, known as the erythroid iron restriction response, serves as a basis for human anemias globally. This response impairs erythropoietin-driven erythropoiesis and underlies erythropoietic repression in iron deficiency anemia. Mechanistically, the erythroid iron restriction response results from inactivation of aconitase enzymes and can be suppressed by providing the aconitase product isocitrate. Recent studies have implicated the erythroid iron restriction response in anemia of chronic disease and inflammation (ACDI), offering new therapeutic avenues for a major clinical problem; however, inflammatory signals may also directly repress erythropoiesis in ACDI. Here, we show that suppression of the erythroid iron restriction response by isocitrate administration corrected anemia and erythropoietic defects in rats with ACDI. In vitro studies demonstrated that erythroid repression by inflammatory signaling is potently modulated by the erythroid iron restriction response in a kinase-dependent pathway involving induction of the erythroid-inhibitory transcription factor PU.1. These results reveal the integration of iron and inflammatory inputs in a therapeutically tractable erythropoietic regulatory circuit. Citation Information: J Clin Invest. 2013;123(8):3624-3633. https://doi.org/10.1172/JCI69746. Progressive osseous heteroplasia (POH) is a rare developmental disorder of heterotopic ossification (HO) caused by heterozygous inactivating germline mutations in the paternal allele of the GNAS gene. Interestingly, POH lesions have a bewildering mosaic distribution. Using clinical, radiographic, and photographic documentation, we found that most of the 12 individuals studied had a lesional bias toward one side or the other, even showing exclusive sidedness. Most strikingly, all had a dermomyotomal distribution of HO lesions. We hypothesized that somatic mutations in a progenitor cell of somitic origin may act on a background of germline haploinsufficiency to cause loss of heterozygosity at the GNAS locus and lead to the unilateral distribution of POH lesions. Taking advantage of the chick system, we examined our hypothesis by mimicking loss of heterozygosity of GNAS expression using dominant-negative GNAS that was introduced into a subset of chick somites, the progenitors that give rise to dermis and muscle. We observed rapid ectopic cartilage and bone induction at the axial and lateral positions in a unilateral distribution corresponding to the injected somites, which suggests that blocking GNAS activity in a targeted population of progenitor cells can lead to mosaic ectopic ossification reminiscent of that seen in POH. Citation Information: J Clin Invest. 2013;123(8):3634-3634. https://doi.org/10.1172/JCI71197. Citation Information: J Clin Invest. 2013;123(8):3634-3634. https://doi.org/10.1172/JCI72174. Citation Information: J Clin Invest. 2013;123(8):3635-3635. https://doi.org/10.1172/JCI71663. Citation Information: J Clin Invest. 2013;123(8):3635-3635. https://doi.org/10.1172/JCI72103.